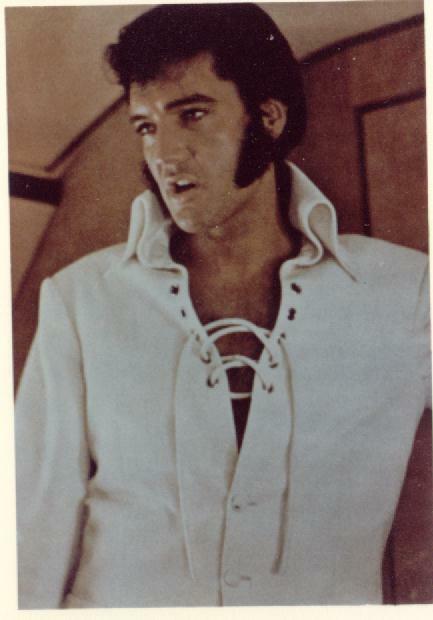 Welcome to My Elvis Presley Fan Site. My Name is Wayne and I Have Been a Long Time Elvis Presley Fan, I Have Been To Memphis 4 Time's ,This site will Have Pictures News and Infomation About Elvis Presley,I Also Have A Lisa Marie Presley Fan Site. This Is A Non Profit Site And Is Made For enjoyment of ourselves and other Elvis Presley fans,This site is not associated with www.Elvis.com or www.lisamariepresley.com . Elvis Elvis Presley, Graceland, TCB, are registered trademarks of Elvis Presley Enterprises,We make no claim to Elvis Presley,Elvis Presley Enterprises,His Music,Videos or Voice. A special thanks to the owner (Rebecca) My sister site. 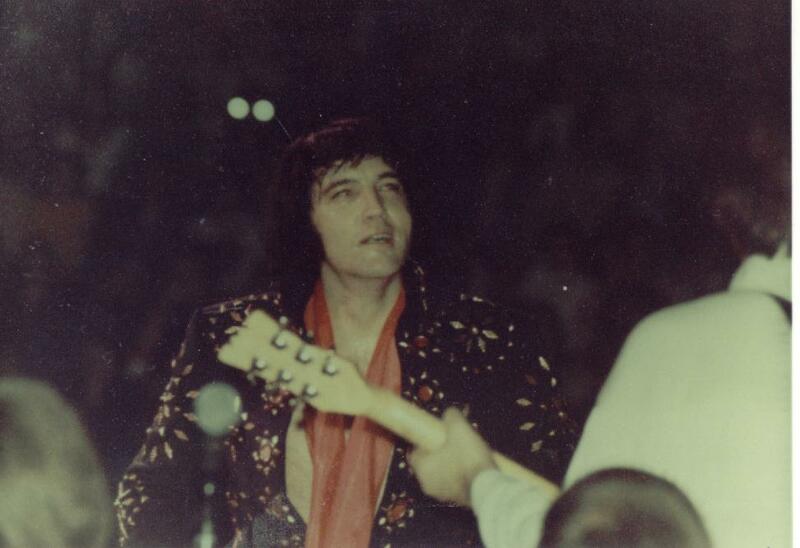 Wayne's Elvis Presley Fan Site Banners Please Link Me! Here are my banners, please pick one and link it back to or just leave it in text link. 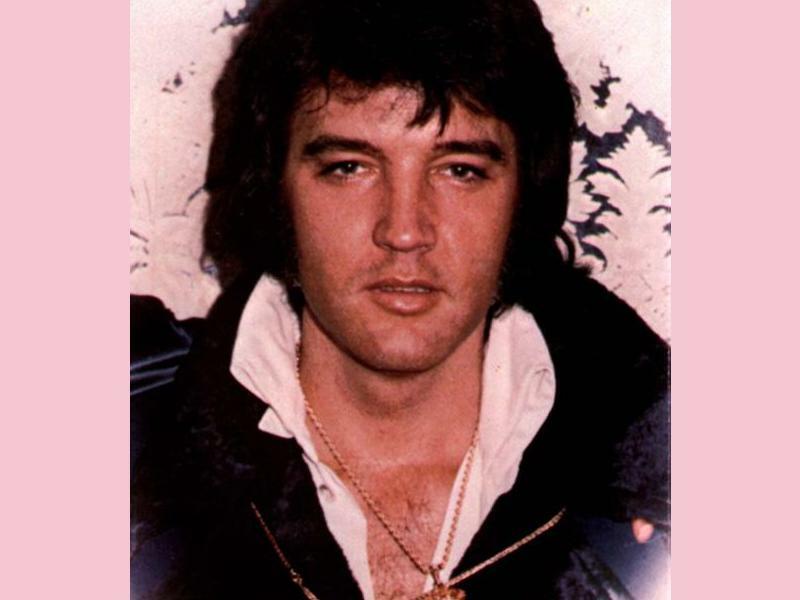 A Very Special Thanks To Kitty From The Fan Site My Sister Site, For Making The Six Elvis Presley Banners Above For My Site,First Two Are New As Of April 28th 2007,Thanks Again Kitty,Click On Kitty's So Real Fan Site Banner To See Her Lisa Marie Presley Site,It Is Excellent. 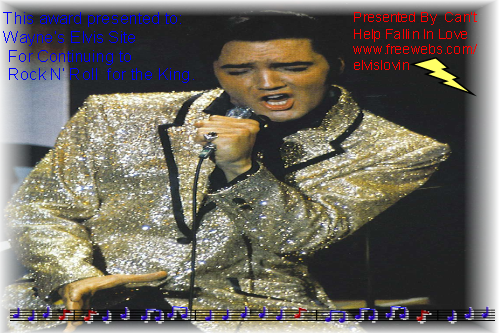 A Very Special Thanks To Rebecca From The Fan Site ,My Sister Site, For Making The Elvis Presley Banner Above For My Site,Thanks Again Becca,Click On Becca's Can't Help Falling In Love With Elvis And Lisa Marie Fan Site Banner To See Her Elvis Presley and Lisa Marie Presley Site,It Is Excellent. To commemorate the 30th anniversary of her father's death, Lisa Marie Presley not only decided to sing, but to sing with him. "I wanted to use this for something good," she tells Spinner of her posthumous 'In the Ghetto' duet with Elvis Presley. "All fingers pointed towards New Orleans." She filmed the video in the hurricane-ravaged city, and all proceeds from the video and single will benefit a new Presley Place transitional housing campus there. Elvis Week August 2007 This Year Lisa Marie Presley Turned on The Lights Upstairs In Graceland And Turned On The Light In Elvis' Room,On August 15th During The Candlelight Vigel,That Was Very Special,and She Also Premeired A New Duet With Elvis Elvis and Lisa Marie Presley's 'In the Ghetto' At Elvis Presley In Concert In MemphisAugust 16, 2007 for Elvis: The 30th Anniversary Concert. TV Land To Honor Elvis With Life-Sized Sculpture, On-Air Tribute: TV Land will celebrate the life and times of music legend and pop icon Elvis Presley throughout the summer of 2007. Kicking off TV Land's tribute to Elvis in late July, TV Land and the city of Honolulu, Hawaii will honor Elvis with a life-sized bronze sculpture. The statue will grace The Neal S. Blaisdell Center, formerly The Honolulu International Center, the site of Elvis' 1973 Aloha from Hawaii concert, which was seen globally on television. 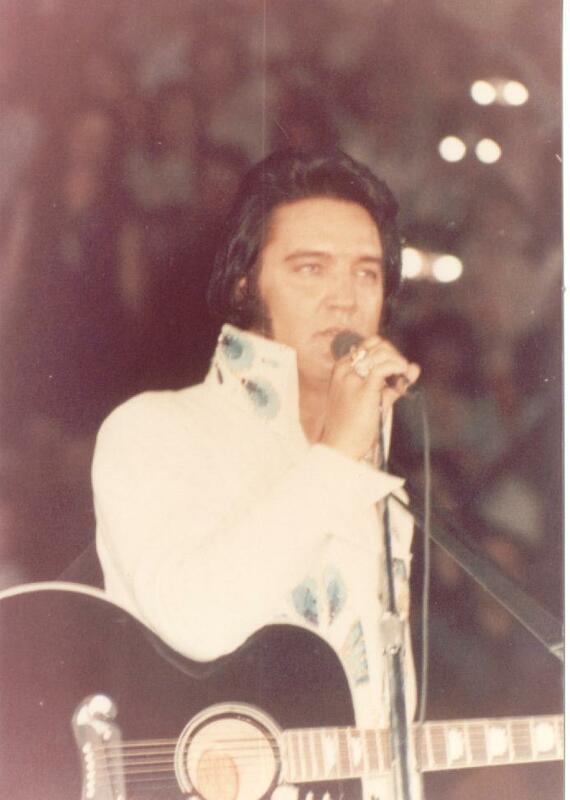 Fans can log on today at TVLand.com to view video excerpts and photos from Elvis's historic Aloha From Hawaii performance. Following this momentous event, beginning Aug. 1, 2007, TV Land will celebrate Elvis with an on-air tribute commemorating his unprecedented legacy throughout the entire month. From the '68 Comeback Special to Aloha from Hawaii to the documentary "Elvis By The Presleys" to his much-loved films like Love Me Tender and Wild in the Country, TV Land will showcase Elvis Presley's work every single day in August. "Graceland, 50th Anniversary" has arrived! Thomas Kinkade and Priscilla Presley officially unveiled �Graceland, 50th Anniversary� (Saturday) March 24th 2007 in Memphis. 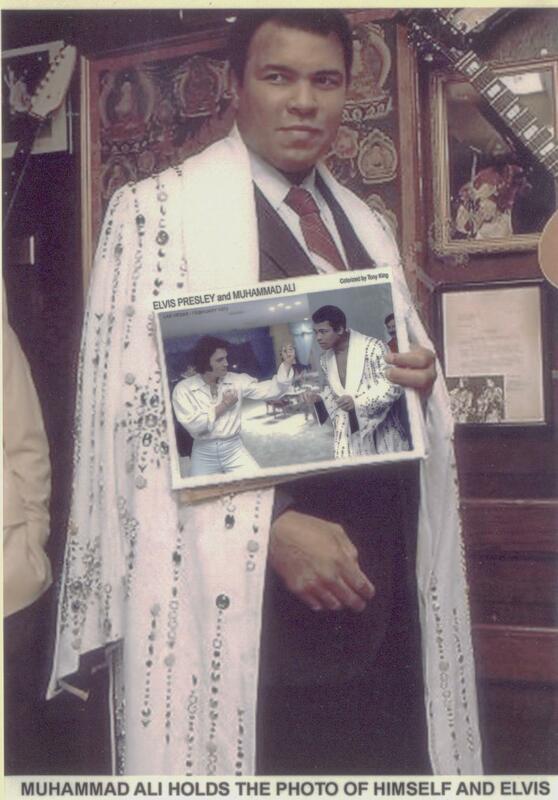 The painting helps celebrate the 50th anniversary of Elvis� purchase of Graceland, his refuge from the crush of fame. �I truly believe we have an opportunity with this painting to commemorate an American icon,� Kinkade says, �That home was a dream for a lot of people � a vision of the good life. And the home, 50 years later, is a kind of lasting emblem of the legacy of Elvis�. Click on the link below to see �Graceland, 50th Anniversary�. The 50th Anniversary of Graceland March 23rd 2007. Friday June 30th 2006 - A Big Exciting Day For Graceland, and Elvis Fans Everywere,Including Myself, It Was Very Exciting Listening To Elvis Radio 13, Covered By Elvis Radio 13 On Sirius Satellite ,Elvis Radio 13 Played All Favorite Elvis Presley Songs, Selcected by Japanese Prime Minister Koizumi, Elvis Radio 13 Had Been Talking To Many Fans Who Were There , Many Other TV And Satellite Networks , Local and National Media Were There As Well,Presedint Bush and First Lady Mrs Bush,Takes Japanese Prime Minister Koizumi To Graceland, And They Got A Tour Of Graceland Bye Priscilla Presley And Lisa Marie Presley. 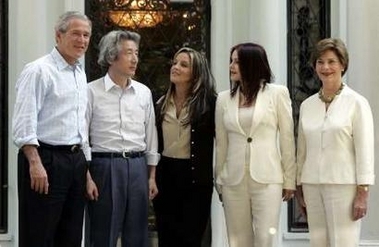 Japanese Prime Minister Junichiro Koizumi scored BIG points with everyone who met him at Graceland and in Memphis today. He came across as just an average guy ... and NO QUESTION his knowledge of Elvis Presley, his idol. 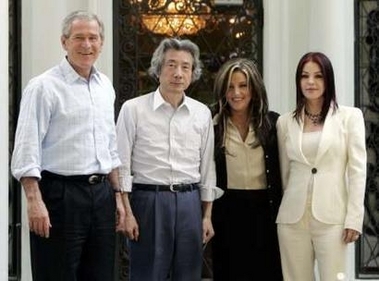 Koizumi, President and Mrs. George W. Bush were given an hour's escorted tour of Graceland by Priscilla and Lisa Marie Presley, but insiders say the "escorted" part was really not necessary; that Koizumi pretty well knew all about the inside of the mansion. Elvis' famous pink Cadillac convertible was brought from the auto museum across the street to Graceland's lawn to save time. He sang Elvis songs in the Jungle Room. He hugged Lisa Marie. He truly expressed joy in visiting the Home of the King ! 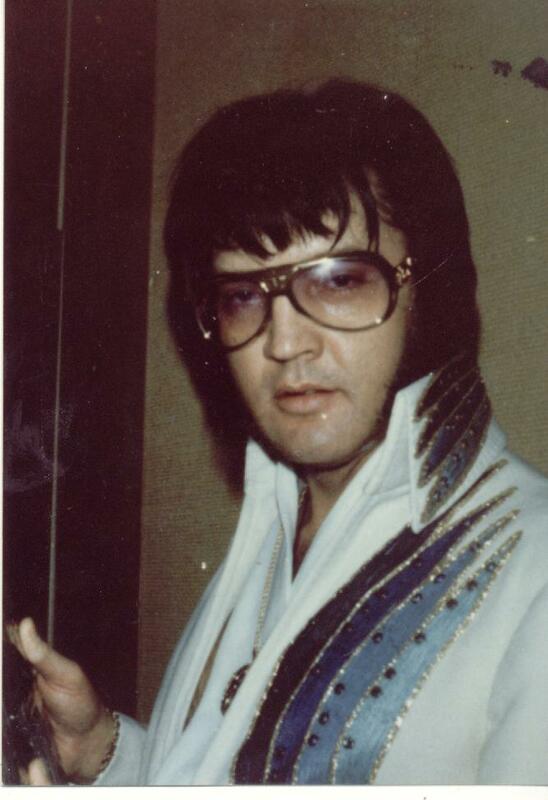 He was given a pair of Elvis sun glasses, which he put on immediately and did his post-tour press comments wearing them. President Bush was given one of Elvis' big belt buckles. Will go well with his blue jeans he wears at his ranch in Crawford, Texas. After a tour of the National Civil Rights Museum, conducted by our longtime friend, Dr. Benjamin Hooks, the group then dined on BBQ at the Rendezvous. There they were fed chopped BBQ, BBQ ribs, slaw and potato salad on paper plates; with an apple cobbler and vanilla ice cream dessert. They were entertained by The Dempseys, who used to be the house band at EP's Memphis, and, sure enough, Koizumi left his BBQ, grabbed a microphone and sang a couple of Elvis songs with the band. AFTER, Bush flew on to Ohio for a campaign stop and Koizumi reportedly flew on to New Orleans. 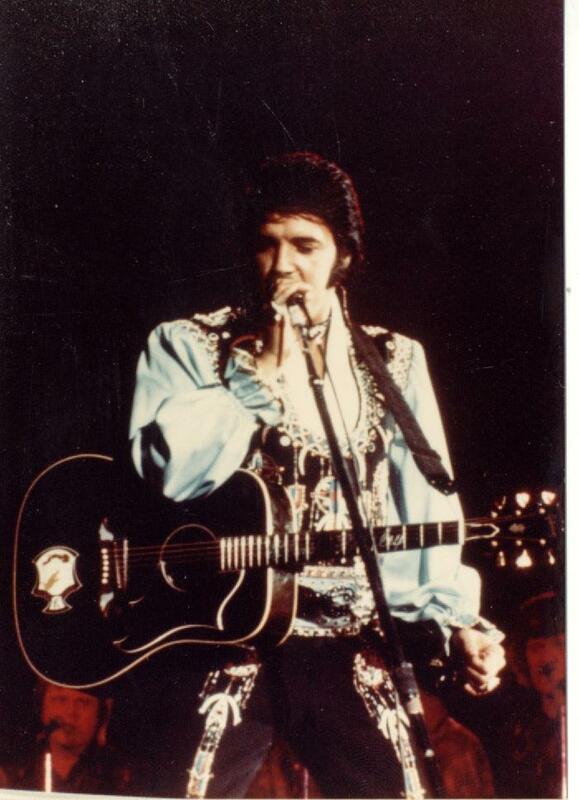 Graceland has been designated as a National Historic Landmark. Graceland has been designated as a National Historic Landmark. You can watch a video of Priscilla Presley and others at the official ceremony at Graceland which marked this historic occasion. Interior Secretary Gale Norton joined Priscilla Presley on Monday to announce the designation of Graceland, home of the king of rock �n� roll Elvis Presley, as a National Historic Landmark, the highest such recognition accorded by our nation to historic properties. These special places are the actual sites where significant historical events occurred, or where prominent Americans worked or lived, and represent the ideas that shaped our nation. Fewer than 2,500 historic places carry the title of National Historic Landmark. Also on March 27, There Was very special coverage by the Today show on NBC and on Entertainment Tonight. May 6th 2006 - American Idol Taping At Graceland,Priscilla Presley And Lisa Marie Presley Were There, and Will Priscilla Gave The Remaining 4 American Idols A Tour Of Graceland On May 16th. The Show Elvis American Idol Show Aired On 05/09/06 and 05/10/06. 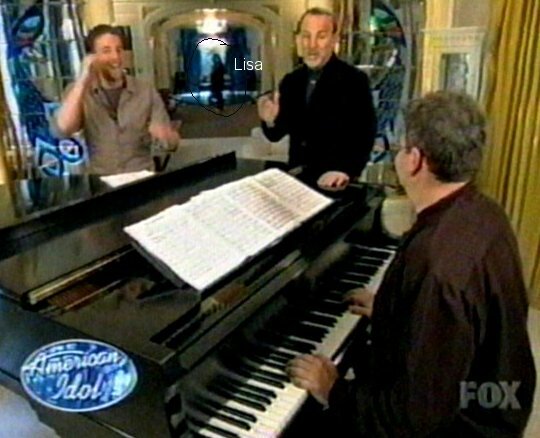 On 05/09/06 Lisa Marie Presley Was Spotted In The Backround During Elliots Rehearsal,and On 05/10/06 The American Idol Show, Played Footage Of When Lisa Took The American Idols For A Ride On The Golf Carts,That Was The Best I Must Add. GracelandCam live shot of Graceland Mansion front entrance. GracelandCam live shot of the front lawn. This is a live view of the Meditation Garden at Graceland. If you are an Elvis Insider, you also have access to the view out of Elvis's bedroom window at the front lawn of Graceland. two shots from Elvis' bedroom window which you can see when you like for just $29.99, courtesy of the new EPE website, Elvis Insider. Launch of the historic, unprecedented 24/7 Webcam on ElvisInsiders.com from Elvis' upstairs bedroom window heralds the premiere of the new Official Elvis Insiders members only Web site. "The dictionary defines an "insider" as a person recognized or accepted as a member of a group, and a person who has access to confidential information and special knowledge, " said Scott Williams, of Elvis Presley Enterprises. "This is what this EPE affinity group has become." Upon joining, members receive a deluxe membership kit, quarterly newsletters, weekly e-newsletters and invitations to upcoming parties and events in Memphis for members only. 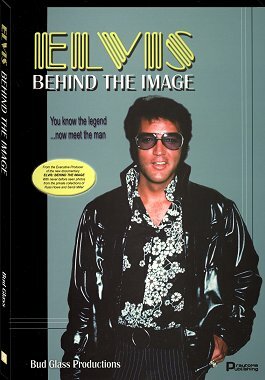 Elvis Insiders receive discounts on all purchases at Graceland, Heartbreak Hotel, Elvis Presley Enterprises gift shops, online merchandise at ShopElvis.com, Sun Studios tours, and The Elvis Catalog. Sirius Satallite Elvis Radio Channel 13 Covered The Elvis Vigil In 2007,And Did A Excellent Job As They Always Do. Sirius Satallite Elvis Radio Channel 13 Covered The Elvis Vigil In 2006,And Did A Excellent Job. "Virtual Wall" for Elvis Week 2005 - to read what fans have posted on The "Virtual Wall" for Elvis Week 2005. 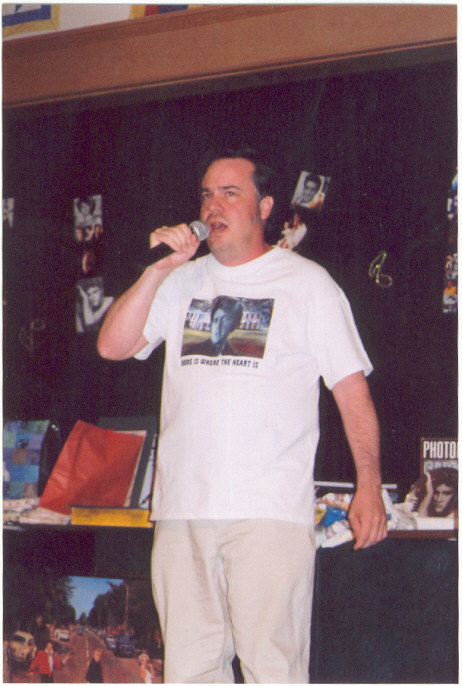 VigilCast 2003, the official Webcast of the Elvis Week 2003 Candlelight Vigil, was broadcast live on Friday, August 15, 8:45PM - 11:00PM CST for AOL and AOL Broadband subscribers. And here is the archival video of the magical event: Below are links to archival audio & video of the VigilCast 2003 presentations. * To listen to audio and view video you will need the Real Player. Download the FREE player here. My Wayne's Elvis Presley Fan Site Is Not Associated With True Fan's For Elvis Other Than That I Am A Member Of The Fan Club,I Highly Recommend This Club, And I Am Promoting Our Club For Them,For Information On Events Or Joining You Can Email or Write For Info To Join True Fans For Elvis The Address Or Email Are Below. True Fans For Elvis 2008 Retreat A Special thanks to Joe Karas for use of the picture and Story about the 2008 Elvis Retreat. This Would Have Been My Fifth Year Attending The Elvis Retreat At Camp Sunshine May 18th May 19th and May 20th ,Because Something Came Up , I Was Not Able To Attend,I Did Stop By To See Some Members For A Short Time On May 18th,And The Elvis Retreat I Heard Was Great,I Plan To Attend Next Year . The Elvis Retreat At Camp Sunshine Was May 19th,20 and 21st. The Elvis Retreat At Camp Sunshine Gets More And More Popular Every Year,I Had Got News That as of December 5th 2005 There had already 40 reservations paid for May Of 2006! 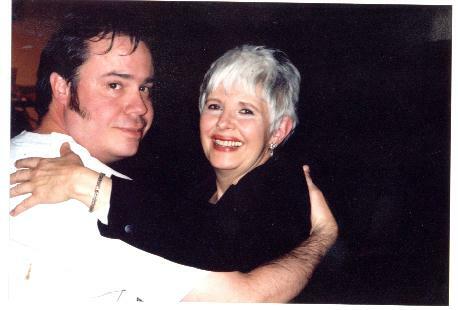 As Of April 19th 2006, Our Guest Speakers Were Announced In The True Fans For Elvis Newsletter,The Guest Speakers For The Elvis Retreat At Camp Sunshine 2006 Was Nancy Shockley & Louis Black,the children of the late Bill Black. Bill Black passed away in 1965 and never left behind any written memories that could be shared with Elvis Fans Around The world. 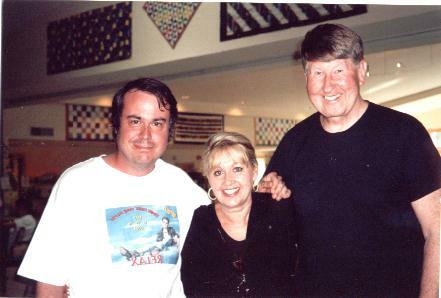 This Was My First Time Meeting , Nancy Shockley & Louis Black,the children of the late Bill Black. It Was Friday May 19th and i Had Just Arived at the Elvis Retreat,This Year I Brought Elvis Radio 13 on Sirius Satillite Radio, So Members Of The Fan Club Were Listening to George Klein's Radio Show,I Learned That A Few Members Are Also Sirius Satellite Radio Subscribers,It Was A First For The Club Listening to A Broadcast From Graceland Via Satilite,It Seemed To Be A Success, Members Enjoying It,I Was Thanked By Some For bringing It,Some Asked Me About Elvis Radio 13,Tonight Dinner Is at 7:00pm Im Having Lobster Some Had Steak Corn On The Cob,a Potato and Salad,There Were No Clams This Year,Nancy Shockley & Louis Black,the children of the late Bill Black are Here Signing Autographs,They Were So Nice,Took time To Talk With People Indavidualy,Sign Autographs,The Sirius Satallite Radio Was On All Through Dinner on Elvis Radio 13,There were Tables Set With Elvis Memorabilia All Day,After Dinner There Were Two Singers Tony And Robert Singing Elvis Songs,Not In Costume,They are Very Good,And The Fan Club Looks Forward To Hearing Them Every Year,After They Sang The Elvis Channel Was Turned Back On ,I Walked Down To The beach At Camp Sunshine Once Today. There Was A Bonfire Sqedualed After The Entertainment But Canceled Due To Rain,Although People Sat Around The Fireplace Inside at The Cafateria, Members Could Make Smores , I Did Attend And Thought it Was Nicer. Saturday May 20th,I Was Up At 9pm,Walked into The Cafateria And Imedieatly Heard Elvis Radio,Till 12:00pm Today Both Nancy Shockley & Louis Black Spoke Shared Memories They Had Of Bill Black,Elvis,Things There Dad Bill Black Shared About Elvis, Answered Questions Members Had,And Again Met And Talked With Everyone Indavidually,They Both Mentioned How Much They Enjoyed Being With Us,And Hope to Be Able To Do This Again Some Year,At 1:00pm It was Open Mic,I Sang With My Friend Joe Karas Some Songs We Worked On,Gospel Songs My Friend Joe Karas Wanted to Try,We Did Start Of Though Singing A Duet Of One Broken Heart For Sale,Then We Sang Ive Got Confidence, Broke Up The Song Were I Would Sing Parts and My friend Joe Karas Sang Parts, I John We Broke Up The Song Were I Would Sing Parts and My Friend Joe Karas Sang Parts,We Sang Bosom Of Abraham The Same Way,My FriendJoe Karas Had Some Non Elvis Songs He Sang ,Members Loved,,I Sang Alone Kentucky Rain ,Seperate Ways,Patch it Up,A Couple Other ,I Got Allot of Compements On My Singing after, Members Sang Some and Nancy Shockley And Daughter of Bill Black,She Has A Beutiful Voice,i Told Nancy Shockley & Louis Black That They Both Told Me That They Liked My Singing,The Open Mic ended Around 2:00pm and Elvis Radio 13 Was Turned Back On 6:00pm - 7:00pm - Social Hour 7:00pm - - Hot And Cold Buffet,A Elvis Auction Followed.Elvis Radio 13 Was On Till The Auction,My Friend Took A Picture Of Me With Nancy Shockley & Louis Black During The Auction. And My Friend Joe Karas Took A Picure While I Was Singing,Used With Permition. Then Turned Back On After The Auction,The two Singers That Sang Friday Sang a Few Songs Again After,This year No One Played Miniature Golf or Paddle Boats, It Was Raining Allot On And off Though,The Entire Weekend. Sunday May 21 I Was Up At 6:00am,And The Weekend Went By Quick,The Weather Was Nicer Today,And Today Is The Goodbye Brunch,said Goodbye,I Got More Complementes on My Singing Yesterday,Said Our Goodbye's ,Walked Down To The Beach Once Today At Camp Sunshine. We raised about $3,400 from the auction.Next year's weekend will be May 18, 19, 20. Payments have already started to come in too! 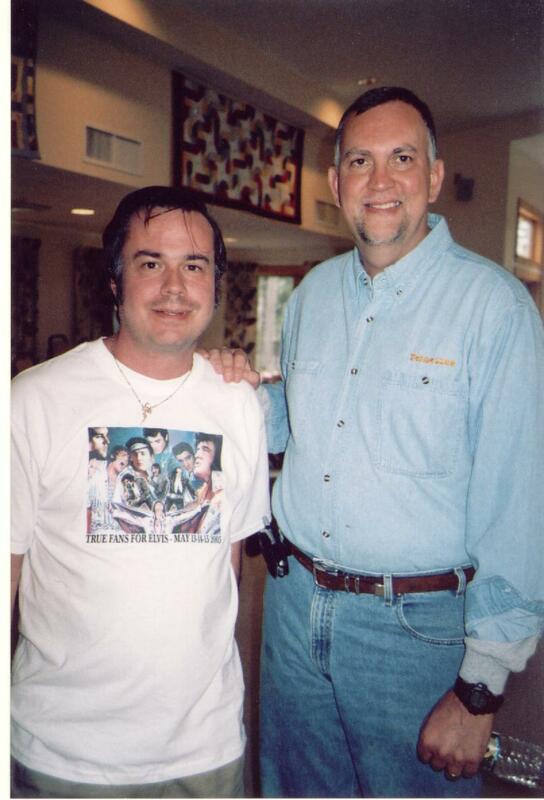 Used With Permition,My Friend Joe Karas Has Also Wrote About Meeting Nancy Shockley & Louis Black , And the True Fans For Elvis Fan Club Retreat May 19th May 20th and May 21st 2006. Understandably, my blue suede shoes cried a few tears when I took them off at the end of our 2006 Retreat. 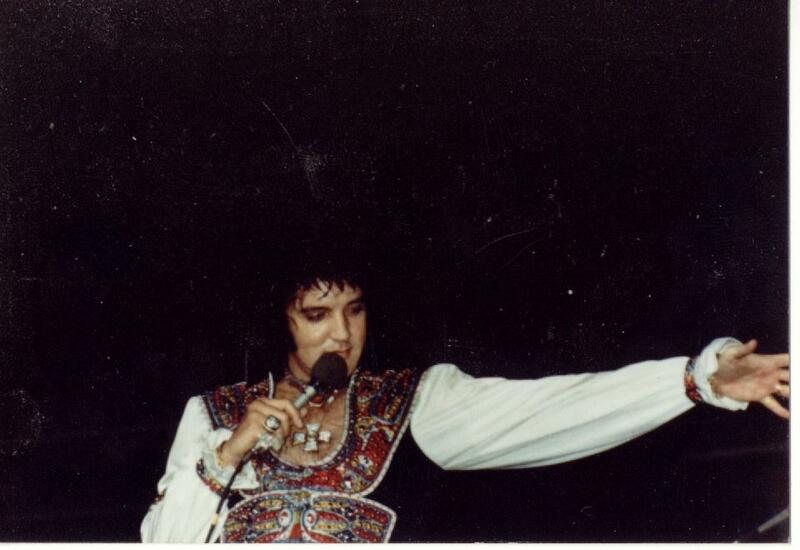 True Fans For Elvis Fan Club Retreats always soar well above the word: FABULOUS! A tremendous addition this year was made possible by Wayne Smith who brought his Satalite Sirius Radio equipment to Camp Sunshine. Throughout the retreat Channel Elvis 13 Memphis was playing for all to enjoy. What a great blend of Elvis music and insightful, informative features plus entertaining D.J. commentary. Over the weekend, I spoke, via cell phone, with a DJ on the air named Nikki. I told her about our retreat going on in Maine and requested a couple of songs which were played just a few minutes after making my request. Consider this: Those responsible for selecting our featured guests have very special talents, indeed! Not only do our guests bring fastenating, endless first hand Elvis experiences, they bring their beautiful friendliness, kindness, and openness. 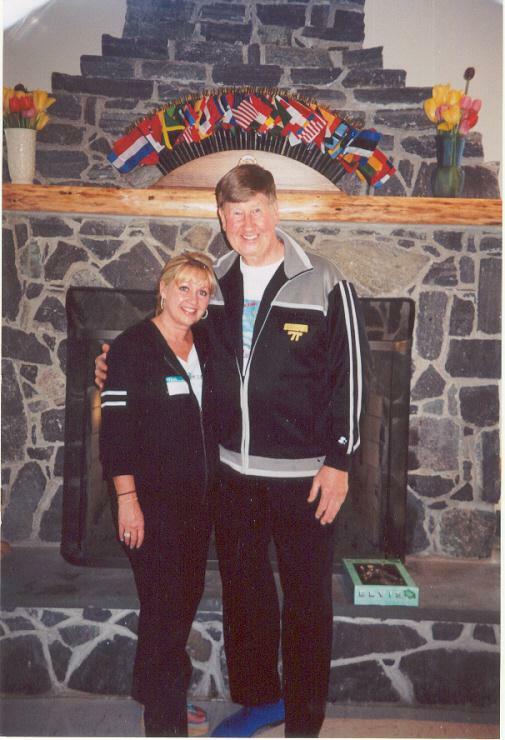 Louis and Nancy, Bill Black's Son and Daughter >> Brilliant Stars lighting up Camp Sunshine all weekend long!! ThankYou Louis and Nancy!! Everyone eating a Lobster Dinner at my table was happier than an itchy pig scratching it's back on a rail fence. FANTASTIC! And, if you didn't have at least three servings of the incredibly delicious Turkey Dinner Saturday evening, well, all I can say is, there must be something seriously wrong with you! The steak eaters seemed extremely happy as well! Tony and Robert, always at their best! How fortunate we are to have them! Thanks to all who cooked, prepared, and served. Now, with a hearty thankyouverymuch to one and all, I remain your faithful and resourceful masked rider of the plains....Joe Karas. 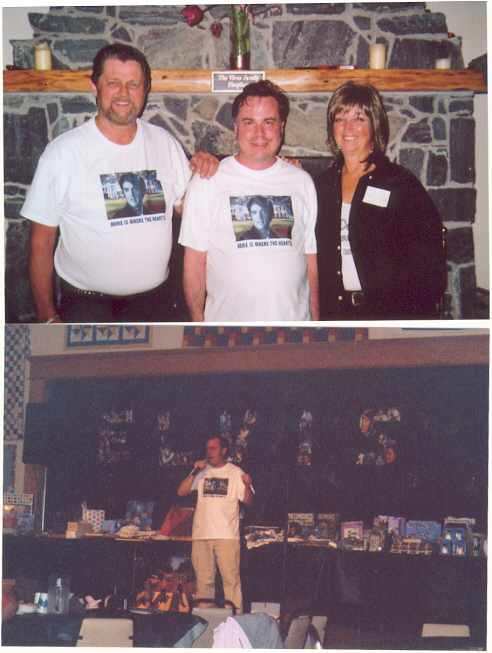 The Elvis Retreat At Camp Sunshine Came Up,I Attended Again This Year,It Has been 10 Years since Sam Thompson Has Been A Speaker For Our Club,We All Were Grateful For Having Him As A Guest Speaker Again. 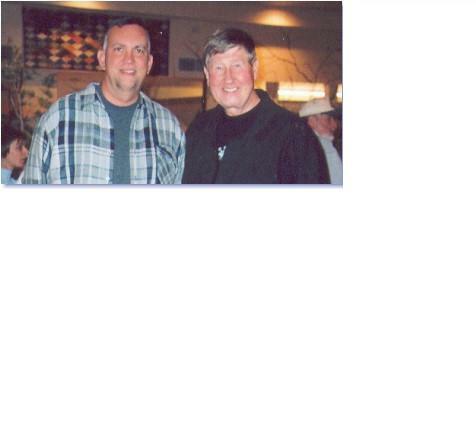 I Met Sam Thompson Two Times , He Had Been A Guest Speaker Before , Its Been A Long time Now And I Will Add Sam Is A Nice Guy , and The Fan Club Looked Very Forward To Seeing Him Again, Hearing His Storys With Elvis and All. This Year The Retreat Filled Up Fast. May 13th - Today Was the Day Finally For the Elvis Retreat At Camp Sunshine,We Could Arrive After 12:00pm and Most Arrived Throughout the Day Some Late,We Had A Choice of Lobster and Steamed Clams Corn On The Cob,a Potato and Salad,People Could Have Steak If They Didn't Want Lobster But Had To Choose this In Advance,When I Arrived I Was Asked To Show A Member Who Had Not Been Here Around,so I Did,There were Tables Set With Elvis Memorabilia All Day,I Went On A Tour Of The Retreat a Second time With The Fan Club President She Was Showing Sam Thompson around,She Asked If I Would Like To Go The Tour Also,I Said Yes,It Is Great to See Sam After 10 Years,They Both were Trying to Remember the Year He Was Here Last,Either 1993 or 1994 They Think,it was At a Different Place though At the Time. 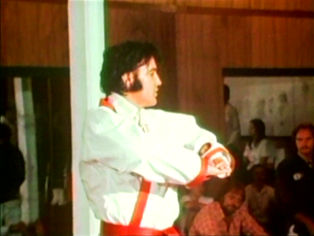 It Is Now 10:36pm I Just Got Done Watching the End Of Elvis By The Presley's With My Friend We Caught The Last 45 Minutes Because the Dinner ran A Little Late Because Some Arrived Later Due To allot Of Traffic ,It Was Great What We Saw Of It , Excellent. I took A Picture Of My Friend Joe Karas And Sam With Joe's Camera. After Dinner There Had Been Entertainment With Three Singers Singing Elvis Songs,Not In Costume,They Are The Same Singers As Last Year,I Will Sing Tomorrow at What There Calling Open Mic. There Was A Bonfire After The Entertainment Members Could Make Smores , I Did Not Attend , I heard Very Few Attended The Bonfire This Year. May 14th - The Day Started out I Played Miniature Golf With A Friend Of Mine,And A Friend Of My Friends,2pm - 4pm Sam Thompson Spoke About His Time With Elvis,If You Ever Have a Chance To Hear Sam Thompson ,He Is A Must To Have at Your Elvis Fan Club Convention,Sam Took The Time to Talk to Everyone Answer Questions They Had,It Was great To See Sam Again after 10 years. 4:00pm - 6:00pm - It Was Time For Open Mic , I Sang 5 songs , Not In Costume, Kentucky Rain , Separate Ways ,I Can Help Not Elvis' Version Duet With Joe Kara's , It's Over . 6:00pm - 7:00pm - Social Hour 7:00pm - - Hot And Cold Buffet,A Elvis Auction Followed. May 15th - 10:00am Goodbye Brunch , Sam Thompson Got In Line With Us For Breakfast , And Sat At Our Table With My My Friend Joe Karas And His Friend , We Talked More Then He Said By to Every We Thanked Him For Coming And Everyone Stood Up And Clapped,then We All Left Shortly After,It Was A great Time. True Fans Is Already Taking Deposits For Next Year,Check Back For A Story About 2005 , True Fans For Elvis Retreat By My Friend Joe Karas And Pictures From This Years Retreat. 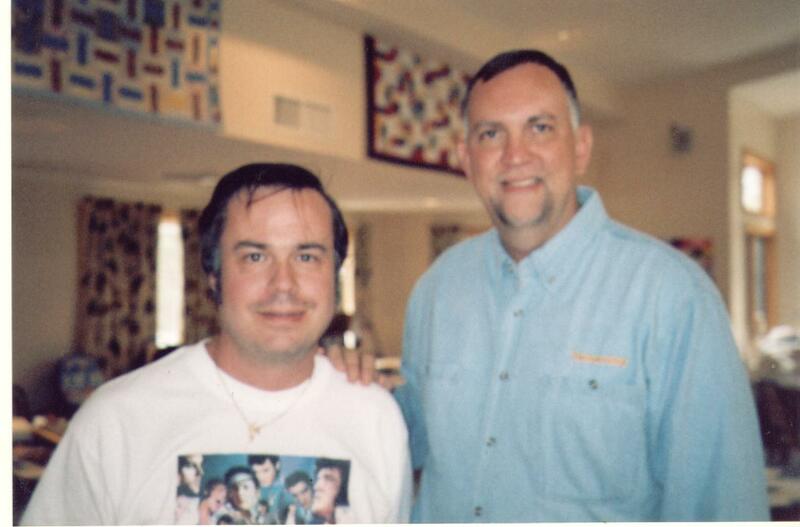 Used With Permition,My Friend Joe Karas Has Also Wrote About Meeting Sam Thompson, And the True Fans For Elvis Fan Club Retreat. May 2005 has 'come and gone' but the memory of that wondrous spring weekend will never go away. I don't want to exaggerate or over-dramatize. Very simply, once again, I believe, everyone who attended had a fantastic time! Beautiful accomodations at Camp Sunshine on the shores of Sabego Lake, ME. Great people to visit with, games, delicious food, a spectacular auction, and so much more! Perhaps the highlight of the entire weekend for all of us was Sam Thompson. What a guy. Open, friendly, willing to answer every question. If you have not had an opportunity to hear Sam talk about those days with Elvis, please make every effort to do so. He is an excellent speaker. 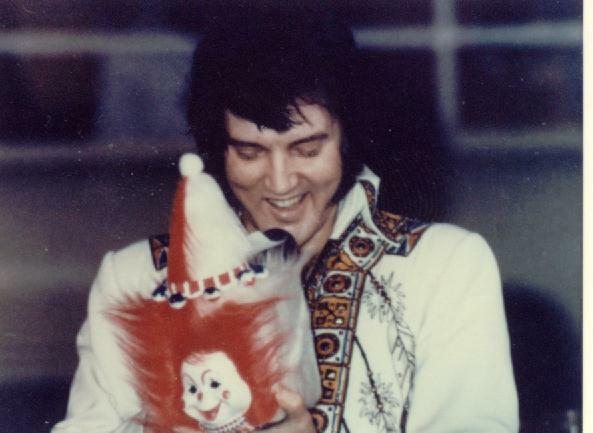 True Fans for Elvis Fan Club has a way of contacting the very best guests for our retreat weekends. Hope to see you at our next retreat. Just contact Wayne at this site for details. By the way, be sure to look up Wayne at the next retreat. He is a very knowledgeable Elvis person... plus, a real talented natural singer. It was a real fun time singing: "I Can Help" with Wayne at the retreat! It seemed like half the floor was up dancing to our performance. I'll never forget it! This is Joe Karas.....Bye for now! 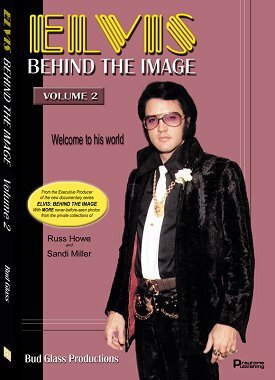 Click The Banner Above To See Her Behind The Image Website On Behind The Image News, Behind The Image DVD , Behind The Image Book , A Link To Order Sandis Book or DVD , And A Link With Elvis Presley Links, ELVIS: Behind The Image Volume 2 "Welcome To His World" THE BOOK is officially released . May 14th , The Weekend Was Here For The Elvis Retreat , I Arived On May 14th and Many Fan Club Members Were Already Having A Great Time ,That Night Was The Lobster Or Steak Dinner , Dinner Was at 7:00pm , And 2:00pm May 15th , Our Guest Sandi Miller Will Speak,I Was Looking Forward To Meeing Her,The Weather Was Great , Just As It Was Last Year , We All Received T Shirts,With A Excellent Picture Of Elvis Presley,That Reads The Elvis Retreat,and In The Picture He Is Wearing A Camp Sunshine T shirt ,The Picture Was Very Nicely Done . There Were 4 Tables Set Up With Some Elvis Memorabilia,On The Stage Is More Elvis Memorabilia For May 15ths Nights Auction. A Friend Of Mine Bought Some Nice Pictures Of Elvis Presley That Sandi Miller Our Guest That Spoke On The 15th At 2:00pm Took ,She Took Alot Of Candids Of Elvis , She Signed Each One For Him , And Asked Him If He Would Like Were They Were Taken Written Down , So She Signed Them And Wrote Were They Were Taken , I Took Two Pictures Of Him With Sandi With His Camera For Him,I Offered To Take The Picture. The Lobster Dinner Was Excellent,Now The Entertainment had been Four Singers singing Elvis Songs , Not In Costume They Did A Great Job , Taking Three are Taking Turns singing , One Sang A Few Songs , Before The Three Singing Taking Turns . My Friend Showed Me One Of Sandi Millers Books,On Display For People To Look At,Her Book Is Excellent,Diary and All,A Must For Any Elvis Fan,My Friend Mentioned That Looking Her Up You Cant Find Much Info on Her Only On Sandy Miller Vernon Presley Was Once Married To Her,I Must Note Our Guest Is Not The Sandy Miller Vernon Presley Was Once Married Too,This Is Her First Fan Club Convention She Has Been Too Also. The Three That Were Taking Turns Singing Sang Up Till 12:00am And Then We all Walked Over To The Bonfire Were Many Toasted Marshmellows And Some Made Smores,Singing Continued There Accompanied By One Of The Singers Who Played The Guitar,Many Were There Till 2:30am or so. May 15th,Many Were Up Till 2:30am At the Bone Fire Singing and Toasting marshmellows Some Made Smores,It Is Now 10:00am , Some have Had Breakfast Already,Breakfast was Not Included In The $75.00 Prce Of The Retreat Weekend,But Very Reasonable,$5.00 More,I Am Looking Forward To Hear Sandy Miller At 2:00pm Today. My Friend And I Played Miniture Golf With My Friend And A Friend Of Sandi Millers Today. Sandi Millers Speach Was Touching,Very Personable,I Loved Listening to Her Storys,Her Books Are A Must Have. There Was More Singing After Sandis Speech , I Sang One Song , Not in Costume , and my friend and i talked to Sandi more And We Had Our Picture Taken With Her. 6:00pm The Dinner Party Started Its Buffet Style,Chicken And Roast Beef Mashed Potatos,Members Got To Preview What The Items For The Auction Will Be. May 16th, Brunch Then The End Of The Elvis Retreat,Every one Sid There Good byes. 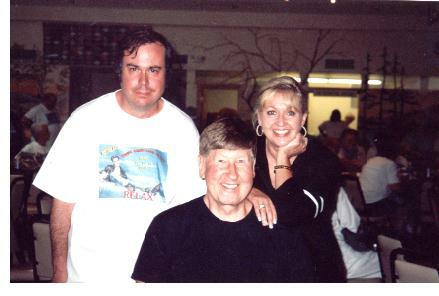 Used With Permition,My Friend Joe Karas Has Also Wrote About Meeting Sandi Miller At the True Fans For Elvis Fan Club Retreat,I Had Asked Joe If I Could Include His Story And Picture. 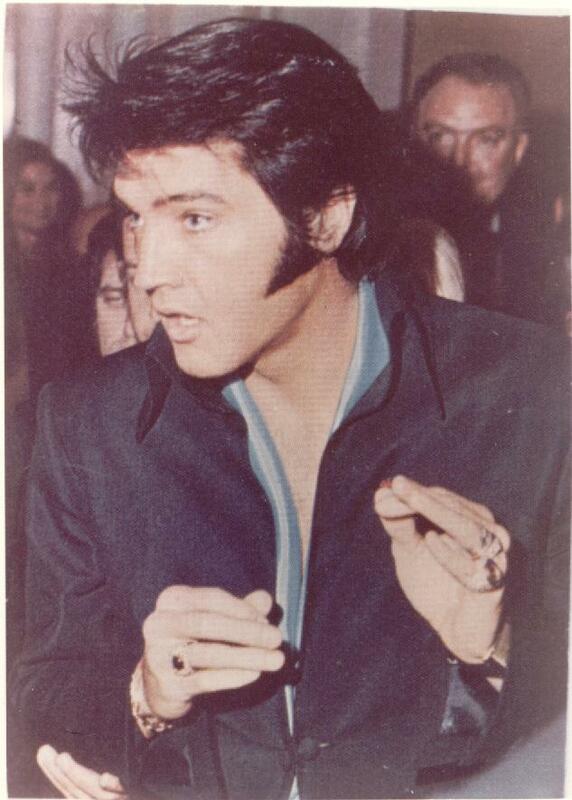 Hi Elvis Fans! 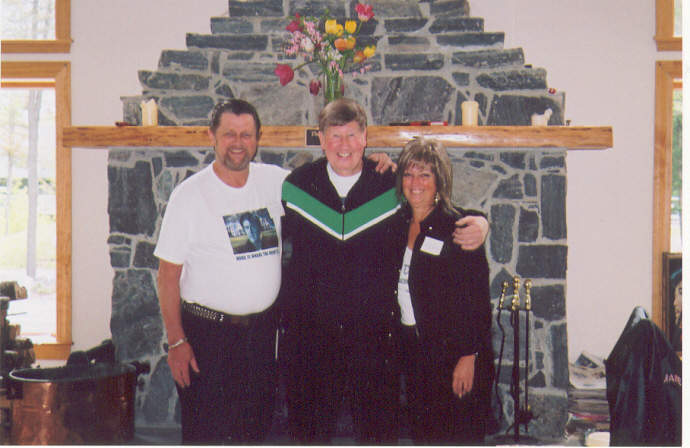 This photo was taken Friday, May 14, 2004 near the shores of Sebago Lake, Casco Maine, at Camp Sunshine. Sandi Miller was a teenager in Southern California in the mid-1960's. 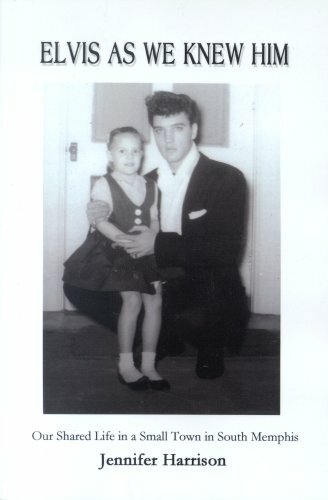 She wanted to see Elvis in person, so, she hung out at the gates of his homes in Los Angeles. (These were the movie making years.) One day, Elvis invited Sandi and her friends onto the property to join in on a barbecue! 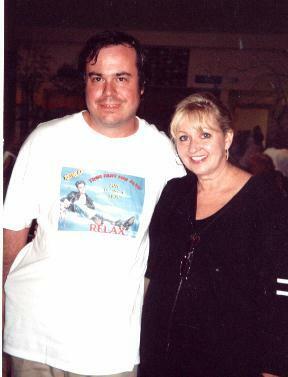 Sandi, and some of her pals, who hung out waiting to see him, became friends with Elvis till his death in 1977. What is so unusual and special about Sandi is that she took hundreds of candid photos, and kept a detailed journal of those incredible years. She's a very private, respectful person regarding her Elvis memories. Sandi, and a friend of mine have been E-Mail buddies for years. My friend invited Sandi to Maine to share memories of Elvis. Sandi is a treasure. A wonderful person. Full of great stories. She answered loads of questions straight on. This was her very first time speaking publicly on Elvis. (Even though it was at a private club setting. Approx. 90 people in attendance.) 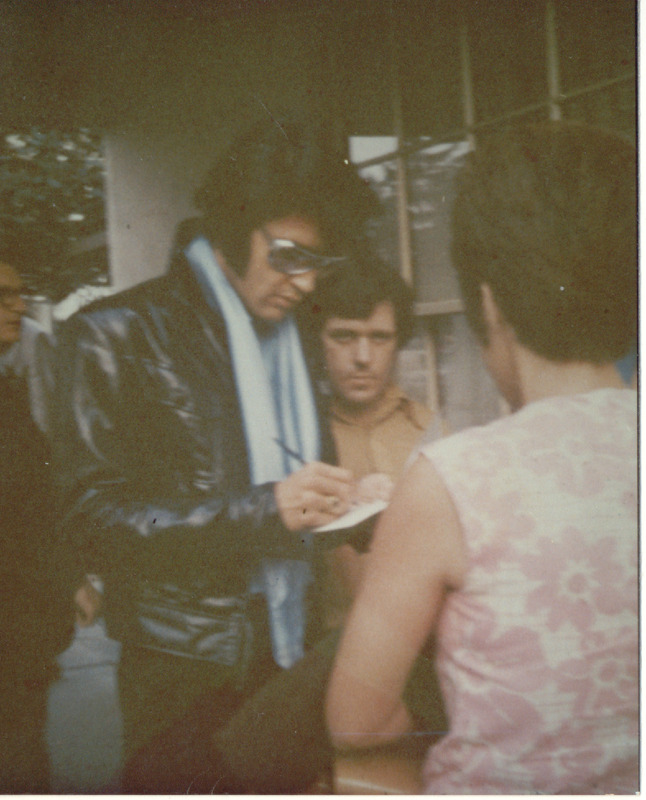 Elvis was concerned about his fans. As an example, an elderly couple used to visit the gates at one of his Los Angeles homes most every weekend. They missed a few weekends, and Elvis wondered what happened to them. No one knew their address. Elvis only knew their first names. Someone thought the couple lived in Van Nuys. A few days later a member of the group said: "Did you hear what happened to the elderly couple?" Elvis brought flowers to their home.They have a trailor in Van Nuys. The gentleman died." 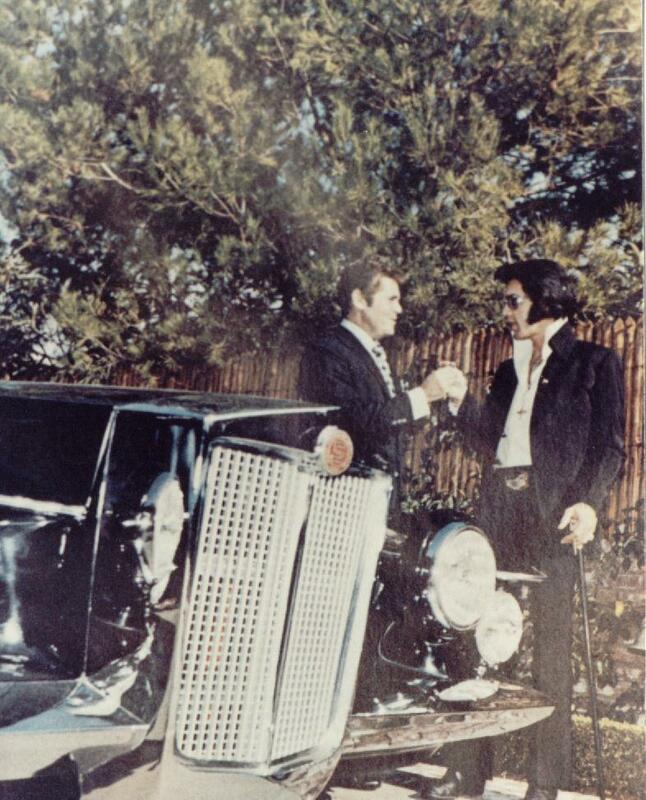 Elvis drove over alone to bring flowers and personally express his sorrow. Everyone wondered how he found out where the couple lived. Elvis used to memorise license plate numbers. He knew their number and asked the police to give him their address. Sometimes Sandi and her friends would hitch hike from Beverly Hills back to their homes in Orange County. When Elvis heard about this he lectured everyone about hitch hiking. He said there are ten cars in the driveway someone can drive you home. No more hitch hiking if you want to visit here! So many more stories. 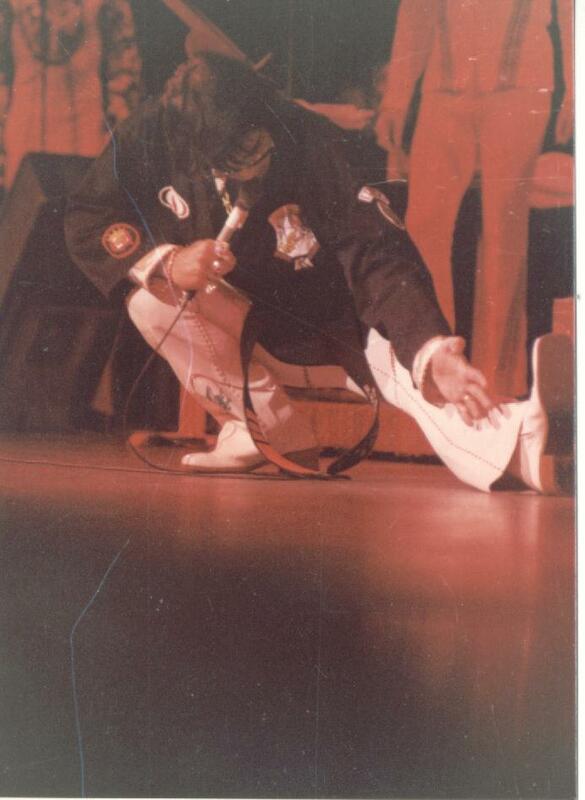 I was able to add some of Sandi's photos to my Elvis collection. Candids of him at RCA Recording Studios in Los Angeles. 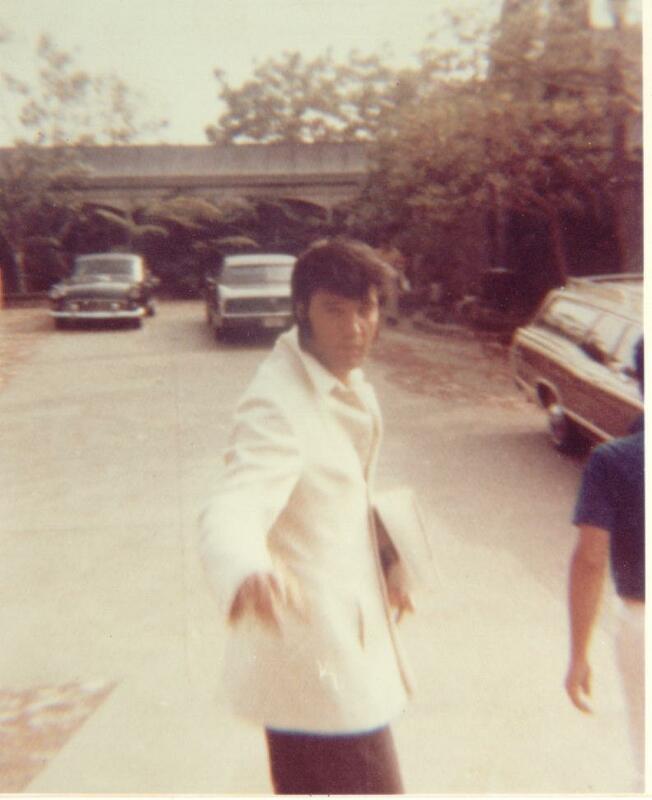 A great shot taken of him at 1174 Hillcrest Avenue, Trousdale Estates, Beverly Hills, California. (Easy to be confused with the name Sandi Miller. Vernon, Elvis' Dad was married to Gladys, then Dee Stanley. His next wife/partner was a nurse, a lady with the same name: Sandy Miller.) Remember, these are two differnt people. thankyouverymuch ---Joe Karas. A Friend Of Mine Joe Karas Wrote This Artical About Julie Parrish Titled JULIE PARRISH ........A Treasure Forever. By, Joe Karas Used On My Site By Permission. True Fans for Elvis Fan Club held a marvelous three day retreat at Camp Sunshine on the shores of Sebago Lake in the state of Maine. Those who were there can not stop thinking and talking about that magnificent weekend in May, 2003. Julie Parrish was our featured guest. We thoroughly enjoyed her talk about being in Paradise Hawaiian Style with Elvis. Julie�s singing was a special delight. Julie answered endless questions about Elvis, and the wondrous experience of working in a movie with The King of Rock and Roll. Not only did Julie share her exciting professional work, she shared herself. Julie spent as much time in the kitchen helping and cleaning as she did doing anything else that weekend. A tray of fresh fruit was carried around by Julie. Selections were offered to club members seated at each table. Julie took time to sit, and visit at each individual table. Imagine being asked to dance by Julie Parrish. Julie asked each guy in the ballroom if he would like to dance. I had the honor, and will never forget our dance. This is Julie Parrish...a treasure. A lady with a beautiful heart filled with love for everyone. It only takes a few moments meeting Julie for the first time to be convinced you�ve been friends forever. Down to earth. Friendly, kind, considerate, thoughtful. What a treasure. I�m grateful I was fortunate enough to meet, and visit with this lovely person. To Julie�s family and friends: I am deeply sorry for our loss. But, you know, Julie knew what is ultimately relevant in life. So, because of this, amazingly enough, warming through my sorrow, comes a smile. I�m smiling for her. I�m happy, and thankful today because of the joy and goodness she brought to all of us. 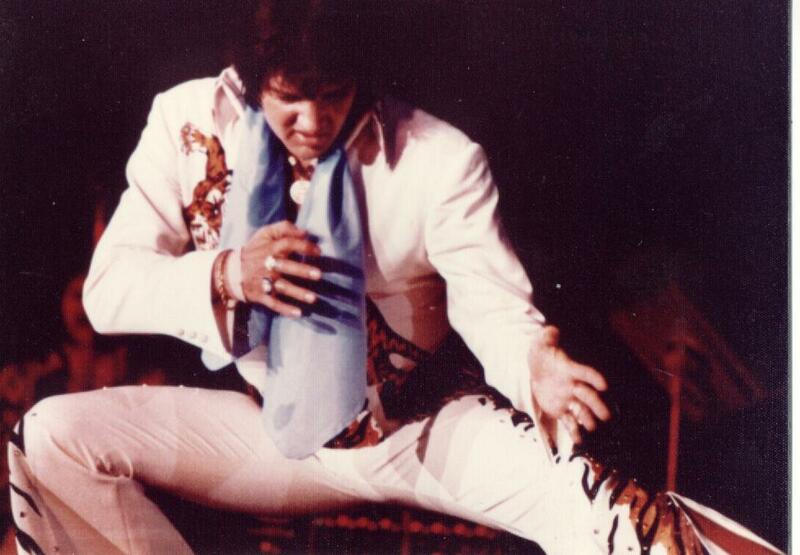 Welcome to the official website of the yours in elvis Forever Fan Club Memphis, TN. Finally, a radio home for The King of Rock and Roll. It's called Elvis Radio. And the only place you can hear it�all day, every day�is on SIRIUS Channel 13. Elvis Radio is a 100% commercial-free channel devoted exclusively to the songs of Elvis Presley, the world's greatest rock and roll superstar and a man who changed music forever. Jerry Schilling's Book Life With Elvis Me And A Guy Named Elvis,Jerry's Lifelong Friendship with Elvis Presley, by Jerry Schilling. 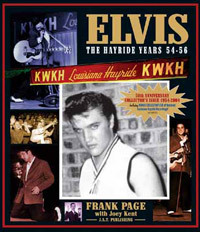 You can also order directly online at: www.essentialelvis.com . Watching Elvis perform in Atlanta in 1956 inspired Diane Coulter Thomas to write a novel called "The Year The Music Changed". It's a coming-of-age story set in 1955 and told as a year-long correspondence between Elvis and a 14-year-old girl. The book will be published September 1, 2005 by The Toby Press. Publisher's Weekly calls it "a warm, lively and immensely readable novel that will especially touch fans of "the King." THE YEAR THE MUSIC CHANGED, it takes place in 1955 and is told as a year of letters between a shy, self-conscious 14-year-old girl and an earnest 20-year-old country singer on the way up, who is Elvis. I saw him in concert in 1956, and that was part of what inspired me to write the book. 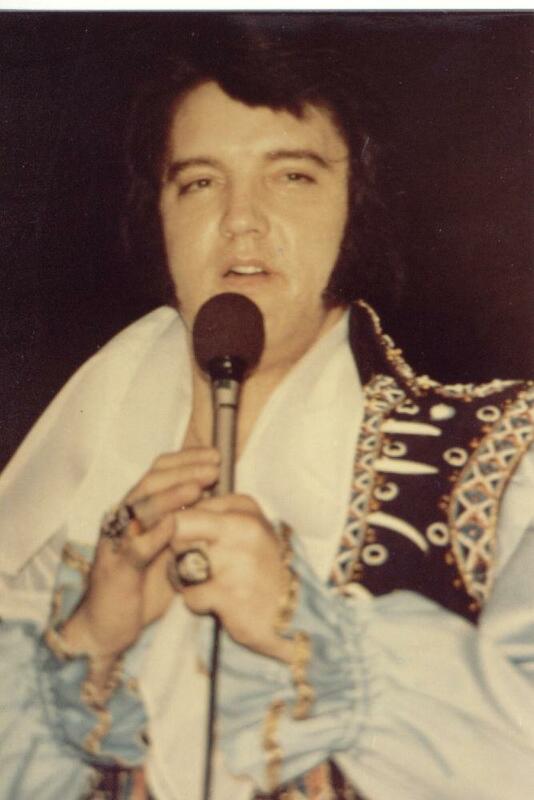 I did a lot of research for it, and all the dates and events in Elvis's letters are historically accurate. The book is already getting great reviews. Publishers Weekly calls it "a warm, lively and immensely readable novel that will especially touch fans of the King." Library Journal writes that it is "touching, funny and tender, . . . highly recommended." Please visit the official BEHIND THE IMAGE web site at the official BEHIND THE IMAGE web site and take a look at what Bud Glass Productions and Praytome Publishing has prepared for your viewing enjoyment as BORN TO ROCK . documented and brought to you in the form of a 4 1/2 minute movie trailer, and a complete photo gallery showing "The making of Born to Rock" in a special series. Please take a few minutes to visit the web site to take a sneak peek and enjoy what we have in store for you. Born to Rock can be ordered now from the web site. Quote from Sandi: My pictures are all in color and originals and the story is how I first met Elvis in 1956 at the Audubon Drive house when I lived in Memphis and goes right along until his funeral. It parallels our lives and talks about what an impact he had on me and how he changed toward the end, both on and off stage. It is written with love. Book Description: Like millions of first-generation Rock & Roll teens, Sandi Haynes Pichon, Author, Columnist & President of TCB ELVIS STYLE Fan Club in Louisiana, was Raised on ELVIS! ELVIS! ELVIS! In between the time she sat with him on his motorcycle at his Audubon Drive home until the day she stood weeping by his coffin inside Graceland, Sandi was front row and center for ELVIS concerts all over the country. As a pre-teen in Memphis, she was there to witness a regional attraction which become a national obsession; she devoted years of her adult life to being part of his global audience, and has since dedicated herself to charities that pay homage to his iconic memory. 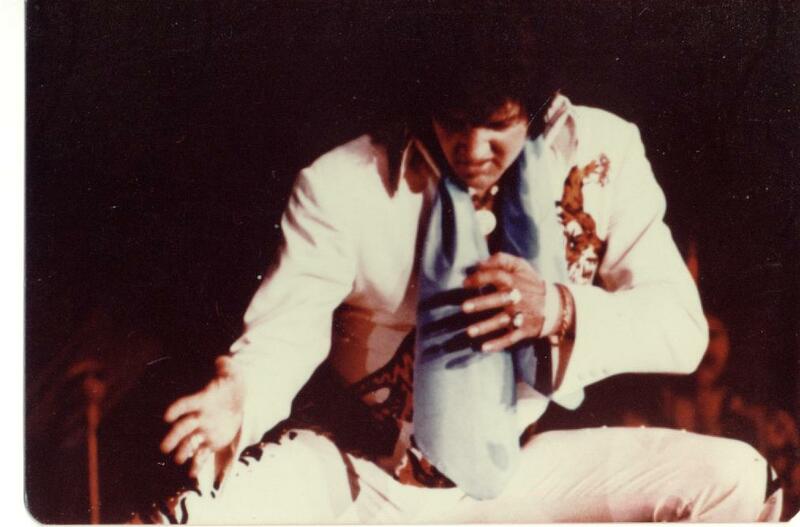 Through several chance meetings with ELVIS himself and friendships with his inner circle Sandi was close enough to feel for the wonderful man that was living in the shadow of his awesome reputation. They exchanged gifts and kisses across the footlights and she was invited to the parties after the shows and even to Graceland Mansion. "I was so fortunate to have been able to have such meaningful contact with the most beloved entertainer ever," Sandi relates. "I always knew that I was there for the millions who wished they were, so this story belongs to all the fans, who have loved him, turned their rooms into shrines to him, and stood by him for all these years." So now enjoy this pictorial novella of a time and place where a man changed the world one heart at a time. It is some way off yet but Sandi Pichon, author of the highly recommended book "Raised On Elvis! Elvis! Elvis!" 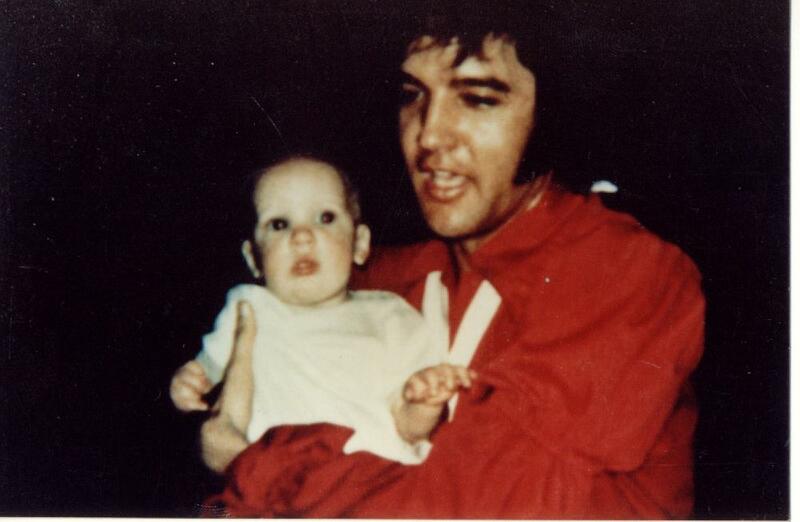 is currently working on her second book which is to be called "Elvis! Elvis! Elvis! Photos From The Heart". 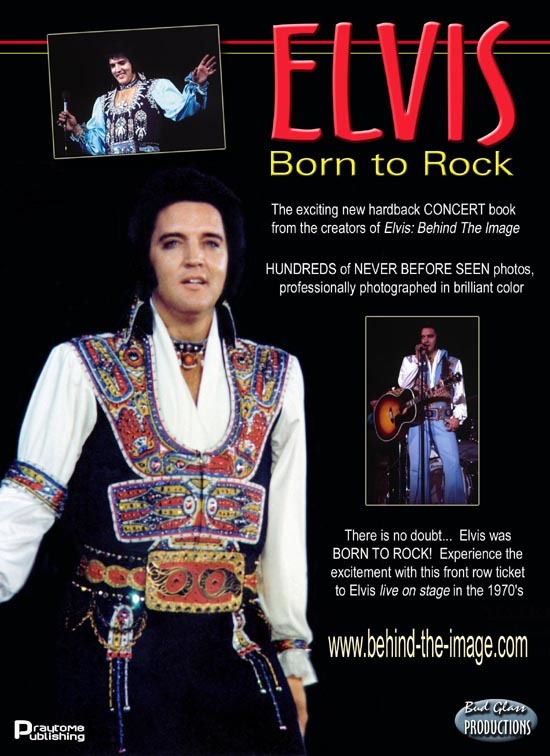 The book will be a 10 x 8 colour concert book and is also going to have a chapter known as "Kisses From Elvis". This chapter will be devoted entirely to the lucky ladies who received those coveted stage kisses. E-mail address: spichon@charter.net and she will sent you all the necessary details. "Raised on Elvis! Elvis! Elvis!" Author , Sandi lives in Slidell, LA and fortunately she was out of state with her husband when the storm hit. For days she has been trying to get information about her home.she found out that her HOUSE is still standing but with over 10 feet of mud and water inside. Their truck, car and the remaining copies of all her books are lost but they are safe. Support Red Cross Hurricane 2005 Relief 9/2/2005 American Red Cross volunteers have been deployed to the hardest hit areas of Hurricane Katrina's destruction, supplying shelter, food, medical service, counseling and other assistance to those in need. The Elvis Presley Charitable Foundation has made a donation to the Red Cross Hurricane 2005 Relief effort and we encourage everyone to do so. You may donate directly to Red Cross Hurricane 2005 Relief . In times of disaster, many Elvis fans wish to make contributions as a group in memory of Elvis. We are in the process of adding a Red Cross option to the online donation form for the Elvis Presley Charitable Foundation . to facilitate this wish. You also have the option of sending in a donation to the foundation via regular mail and designating the Red Cross as beneficiary. Memphis is one of the cities hosting evacuees. During the month of September many of the city's museums and other attractions are offering free or discounted admission to anyone from the three states affected by Hurricane Katrina. Through at least September 15th, tickets to Graceland Mansion and the other attractions on the Graceland complex are free to anyone showing a Louisiana, Mississippi or Alabama driver's license. Elvis Presley Enterprises has joined with Ellen Rolfes Books to develop GRACELAND'S TABLE, a collection of receipes submitted by Elvis fans. Submit your favorite recipe and it maybe choosen to be included, along with your name, in The Graceland's Table Cookbook series. 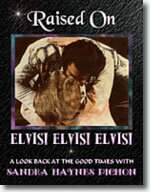 Elvis And Gladys Book Reissued! If you missed the first issue of this book,be sure to grab it the second time around with some never before seen photos inside. 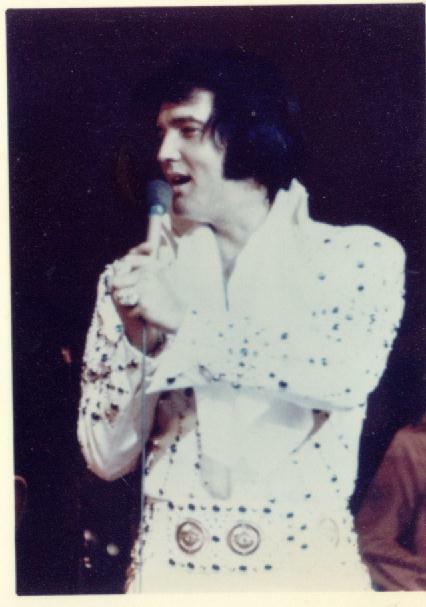 Fifty years after Elvis' first appearance on the Louisiana Hayride a book, documenting the shows from which we all know the recordings, came out. The book is written by Frank Page (announcer at the Hayride) and Joey Kent (owner of the remains of the Hayride) and published by J.A.T. Publishing. The CD that comes with the book sounds better than the many CD?s we know with these (radio) recordings. In stead of replaying some parts the improvement here lays in the new digital remastering. Although we must add that Elvis sound very up-front and the band much to the back. Especially on the first two tracks it sounds a bit ?fragmented?, like the bad pars have been cut out. This book is pure rock and roll, and you can read about the birth while listening to it. By Daniel Wright (1996) Filled With Graphiti Taken From The Wall At Graceland.It Also Gives The History Of The Wall. David Neale has written a book about Elvis and his music. If you have Acrobate Reader - here is an excellent description of the book. Roots of Elvis by David NealeThe book is entirely different than any other book on Elvis published. Click on the Link above to see B&K Enterprises... Internationally Acclaimed Costume Design Since 1980 WebSite reproductions of jumpsuits which were worn by the late King of Rock and Roll. They cater to both fans and impersonators worldwide. Click The Link Above to See Reshae's Elvis Hangout! One of the many links is to the horses which were stabled at Graceland including Ebony's Double. 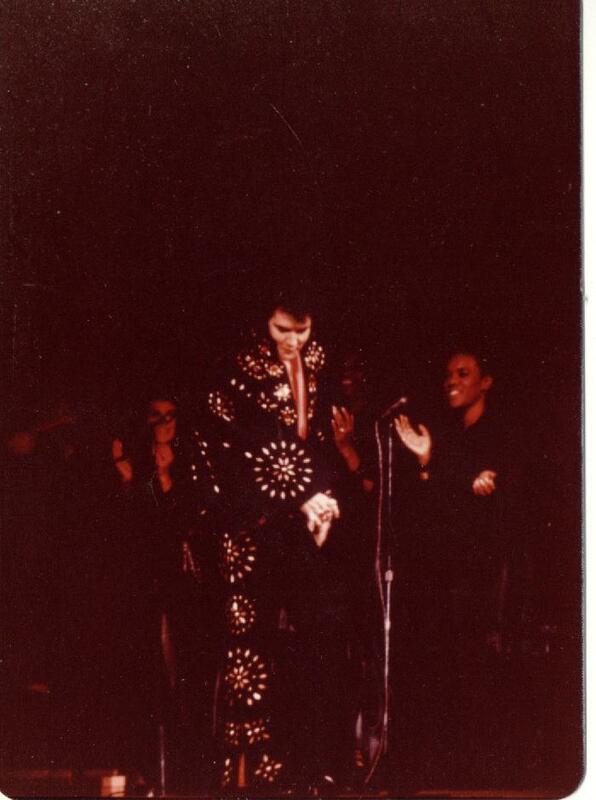 Click on the Link above to see Silvesters Elvis Page , the very first jumpsuit-page in the worldwide net which lists all outfits Elvis has ever woren on stage! Click on the Banner above to see the ElvisFind.com Also Click There To Vote For My Website , For All Who Vote For My Site , Thanks For The Votes. 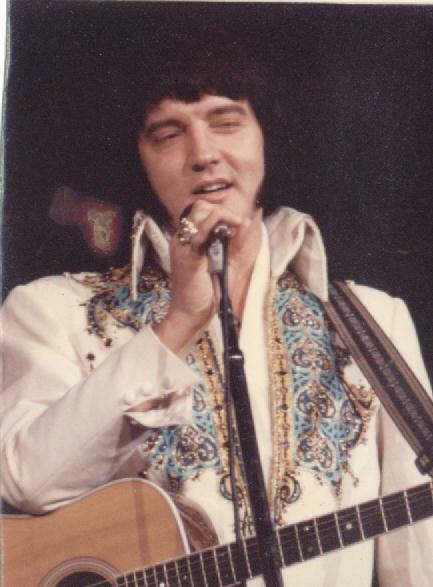 This is The official "go-to" site for DVD content details, news, FAQs, photo galleries, video galleries and more for the DVD sets Elvis: '68 Comeback Special - Deluxe Edition DVD and Elvis, Aloha From Hawaii - Deluxe Edition DVD. Click The Banner Above To Join The Ive Got A Thing About You [Elvis & Cilla], Fanlisting. Click on My Award I Won From Rebeccas Cant Help Fallin In Love Website above , to Read The Requirements For Rebeccas Cant Help Fallin In Love Website Win My Award, And Enter Your Web Site . Disclaimer notice to all persons downloading,viewing or copying this work.We make no claim to Elvis Presley,Elvis Presley Enterprises or Robert F.X. Sillerman and His New Media and Entertainment Company Named CKX,Inc.,Elvis Presley's Music,Videos or Voice(whether trade-marked,copyrighted or otherwise protected by federal,state or other intellectual property law)of Elvis Presley.or any of His respective affiliates or licensees that hold rights to any intellectual property herein alluded to, used,expanded upon or in any way affected by this work.This work is produced solely for the personal,uncompensated enjoyment of ourselves and other Elvis Presley fans,in accordance with the "fair Use" provision of Title 17 of the US Code.This work may be freely distributed provided each of the following conditions are met:(1)the above disclaimer accompanies all copies;(2)the work is distributed in its entirety,and (3) no consideration is requested or received.Distributation of this work not in accordence with the aforementioned procedures shall be deemed unautherized and,as such,is strictly prohibited.when you access any of the non-Wayne's Elvis Presley Fan Site Links Listed on this site,you do so at your own risk.Wayne's Elvis Presley Fan Site is not responsible for the accuracy or reliability of any information,data,graphics,scripts,executable files,opinions,advice,or statements made on these sites.Wayne's Elvis Presley Fan Site.